I admit it may seem weird to review a 50€ pair of loudspeakers on a HiFi magazine as, normally, this is the cost of half a meter of a budget interconnect cable! After the T-Amp phenomenon we're getting used to HiFi components that cost a fraction of what they should but I wasn't ready for such a low-cost speaker. 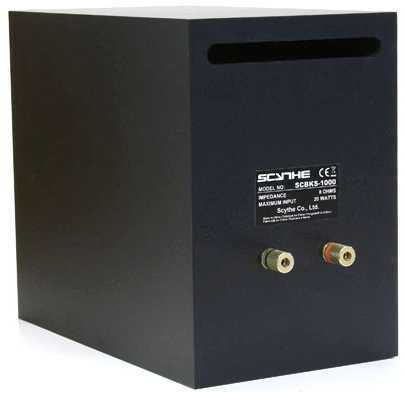 Scythe, after their huge success with the SDA-1000 & 1100 diminutive Class D amps, have decided to offer something similar in the loudspeakers market. The KroCraft under review should be considered the natural partners for their Class D amps. Actually you can buy a pair of KroCraft speakers and a SDA-1100 amp "in bundle" for just 100 € or so. Kool (this gang). 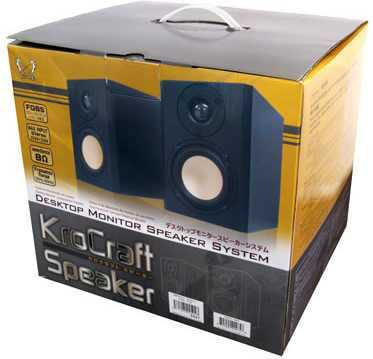 The KroCraft speakers, though labelled as desktop speakers, are much more than that, considering how crappy desktop speakers usually are. For 50 € you get a real two-way compact speaker, with a 100 mm woofer, a 1" dome tweeter, a guided-flow reflex port, a solid MDF cabinet and even audiophile-standard gold-plated binding posts that can accept forks, thick bare wire and even bananas. Also included are 2+2 meters of speakers cable! The speakers are Made in China, though a CE logo can be found in the rear (despite the fact bananas are not allowed under CE rules). The cabinet is very compact though its depth (21 cm!) might not be welcomed for real desktop use. At almost 6 kgs/pair these KroCraft speakers are quite heavy. The cabinet is built with 1 cm-thick MDF and the internal structure, filled with sound absorbing material, is not a standard reflex...it resembles to a simplified transmission line. The manufacturer calls it Guided Flow bass-reflex, have a look at the pic here to get an idea on how it works. The woofer is directly connected to the binding-posts (no filter) while the tweeter is filtered by a simple 400V cap (I've been unable to detect the pF value). Internal wiring is as cheap as it can be, with classic figure-8 1 mm2 wires, connected to the drivers via fast-ons spades. Woofers and tweeters are secured to the front baffle via 4 and 3 screws respectively. I've listened to these speakers with different amps, including the Scythe SDA-1100, of course. I've installed them on a pair of good quality speakers stands, using 4 small sponge-like discs between the speaker base and the stand top. Being unable to find a similarly-priced competitor I've tested them against the Norh 4.0 loudspeakers I reviewed back in 2000 and a pair of Cocaine S40 which, while costing 5 times as much, use a similarly sized woofer. These are the least-expensive speakers I've ever tested (and that I know of). Reviewing such a weird animal is not an easy task since comparisons are always unfair. So I decided to proceed as I did when I reviewed the T-Amp: forget the price tag and let's see what happens. First of all, the KroCraft have a quite lowish sensitivity: it seems close to 82-83 dB/w/m. Considering they can handle 20 watts of power or so they can't be used to have a party. Low sensitivity is the price to pay in order to get reasonable bass extension from such a small midwoofer. And the designer succeeded, as the bass range of these babies is incredibly deep (and powerful) for the size! Using a test disc and a digital SPL meter I've checked whether the 58 Hz statement was close to truth or not. Though the ± dB range hasn't been specified I can say these speakers go down till 60 Hz with a -3dB loss, which is an outstanding result considering the size of the woofer. 40 Hz can be heard though heavily attenuated. The nOrh 4.0 I've used as reference don't go any deeper than this. Moreover, the bass range of the KroCraft is also linear and powerful. A nice, big surprise, I admit. At the other end of the audio spectrum the situation is a little bit worse as the tweeters fail to reproduce 16 kHz flat. Actually, the 16 kHz frequency is rather below the rest of the spectrum. This is confirmed by ear, as there's an audible roll off in the highs, which makes the tonal balance quite warm and soft. For this reason the match with the mostly bright SDA-1100 is extremely synergic: the speakers compensate the amp's tendency to sound bright. With neutral or warm sounding amps these speakers might be too inoffensive in the highs. The mid range is good, though not as crisp as it should be. Voices are clean but a bit on the thin side. And things get worse as volume increases and/or as the musical program becomes more and more complicated. With few instruments and a single voice the reproduction is simply STUNNING, for the price, and it can be compared to that of the nOrh 4.0's. You shouldn't expect a performance rich in harmonics content, but the fundamentals are done right. Sometimes the sound might appear a bit confused, this is perhaps due to the fact the two drivers intersect for a large portion of the audio spectrum. Summarizing, the tonal balance of these Scythe KroCraft speakers is mostly correct, just a bit shy in the highs but I'd consider this as a plus since their natural partners might be bright sounding, as many inexpensive amps and sources are. Easy listening anyone? Maybe! But I'm surprised to hear which level of sound quality can be obtained for this silly money. They're even too good to be used as pure and simple desktop speakers, considering they put my Cambridge Soundworks system to shame. Dynamically these speakers perform quite well, the long-throw woofer performance is incredible! It is quick and possesses a good control. The reflex port is less noisy than standard reflex ports: clearly the air comes out without the usual reflex turbulence. This "guided flow bass-reflex" systems seems to work very well. Dynamic excursions are handled with ease, provided you don't make the woofer reach its physical limit. On the other hand, the tweeter seems a bit lazier and slower. This affects dynamic performance in the highs so much that micro-details (percussions, cymbals etc.) are less precise than they should be. Timing could be better. The nOrh 4.0 perform much better in this area. Anyway, these KroCraft speakers sound quite lively even at moderate listening levels. The sturdy and extremely compact cabinet certainly plays a role here as the speakers can create a reasonable 3D soundstage. No, they can't rival the 4.0's (real masters in this area) but they perform much better than I expected. The virtual stage is acceptably large and deep. Careful installation is mandatory (even some toe-in might be necessary) to get the best results in terms of focus and height of the image. If you close your eyes I might think you're listening to much bigger speakers. A reasonable amount of "break-in" is strongly recommended before listening. In my opinion, 50 hours should be enough, if Music is played relatively loud. After this workout session the sounds opens up. A pair of speakers stands is mandatory to get full audio performance out of these speakers. The problem is that stands might cost more than the speakers themselves!!! Hence, DIY is more than an option, it becomes a must, in this case. Just browse our DIY racks & stands section for some easy and inexpensive idea. Otherwise use a bookshelf with some decoupling rubber or blue/yellow tack between the speakers and the shelf. More generally, with such small and lightweight speakers it is always a good idea to use some tacky material (Blu-Tack or equivalent) to secure them to the speaker stands or to the bookshelf. Let me also suggest you to inspect the drivers bolts and, eventually, tighten them a little bit: chances are you'll find them a bit loose. Do not overtighten! The KroCraft speakers are a quite easy load, they play fine even with few watts (like the 8+8 watts of the SDA-1100 companion) but they can handle higher powers, if needed. Do not force them above their natural limits, tough, the woofer might dislike such a brutal treatment. Anyway, I've measured peaks of 94-95 dB at my listening seat, 2 meters far from the speakers. Not bad, after all. Finally, keep them at least 10 cm far from the rear wall, in order to make the reflex port work well. 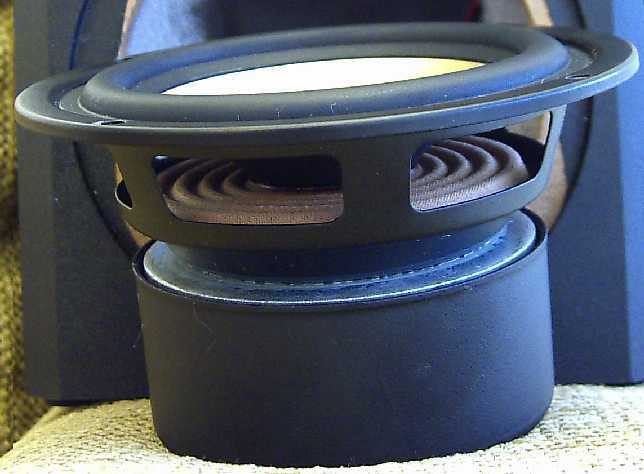 These speakers are nicely built and finished, the black paint seems sturdy and the binding posts are very easy to use. The speakers lack any kind of "feet". Hence, in order to avoid scratches, you need to add your own damping/rubber feet. Avoid threaded spikes as the KroCraft's don't have threaded holes. They don't offer biwiring (see below) and internal wiring is poor (what would you expect?) but even in this case upgrading is easy as 1-2-3. Dust covers (grilles) aren't supplied. Their sensitivity is EXTREMELY low (approx. 82 dB/w/m). Sound. A bit thin in the midrange, with an audible roll-off in the upper highs, harmonically questionable and sometimes confused when the going gets rough. Biwiring isn't necessarily an upgrade but it might be worth a try. Firstly, buy a second pair of binding posts, drill two new holes in the rear and install them. 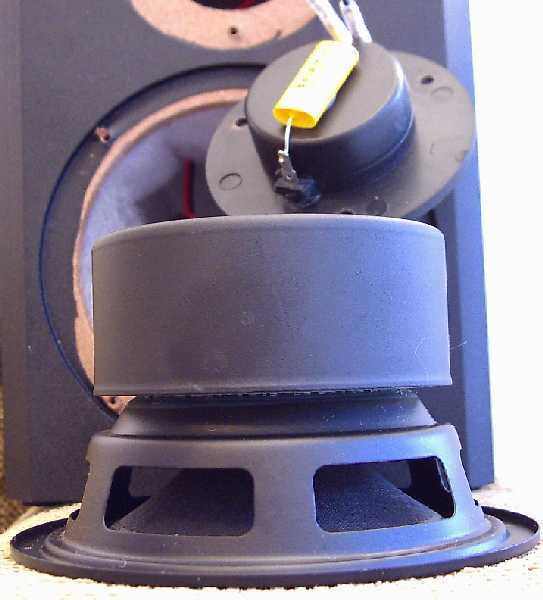 Secondly, cut the wires that connect the woofer to the tweeter and solder them to the new pair of binding posts you had previously installed. While you're there remove those thin internal cables and substitute with something better (at least 2-2.5 mm2 of cross-section). Even CAT5/6 wires can be used. If you wish, install a better filtering cap. Unfortunately the original one is of unknown value (room for trials & errors). Considering the woofer isn't under filter the choice of the cap value is less crucial. Remove the drivers and apply a small quantity or blu-tack (or equivalent) to the cabinet holes that host the drivers, then reinstall the drivers. This will seal any kind of air leak (as there are no drivers gaskets). As said, use rubber feet or spikes depending on the results you wish to achieve (experiment before deciding). 50 € is the cost of two CD's or one 180 gram high-quality vinyl. As desktop speakers these are too good to be true. 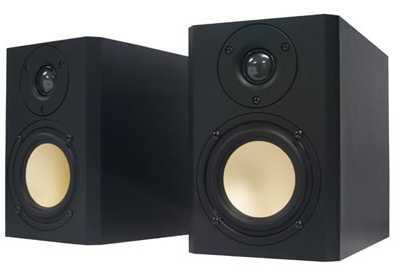 As bookshelf speakers they can be compared with competitors in the 200-250 € range. They need more power than usual because of their low sensitivity. Despite of this, the Scythe KroCraft speakers are embarassingly good. Are these the T-Speakers we've been searching for? Why don't you get down on it?